Purpose: To compare peri-implant bone and soft-tissue levels of immediate non-occlusally loaded versus non-submerged early loaded implants in partially edentulous patients 10 years after loading. Materials and methods: Fifty-two patients were randomised in five Italian private practices: 25 in the immediately loaded group and 27 in the early loaded group. To be immediately loaded, single implants had to be inserted with a torque of at least 30 Ncm, and splinted implants with a torque of at least 20 Ncm. Immediately loaded implants were provided with non-occluding temporary restorations within 48 h. After 2 months, the provisional restorations were put in full occlusion. Implants were early loaded after 2 months. Definitive restorations were provided 8 months after implant placement. Outcome measures were prosthesis failures, implant failures and complications, recorded by non-blinded assessors, and peri-implant bone and soft-tissue levels evaluated by blinded assessors. Results: Fifty-two implants were loaded immediately and 52 early. Three patients with 8 implants dropped out from the immediate group versus two patients with 3 implants from the early loaded group; all remaining patients were followed for at least 10 years after loading. One single immediately loaded implant failed 2 months after placement. Three patients with immediately loaded implants and two with early loaded implants were affected by complications. There were no statistically significant differences for implant/prosthesis failures (Fisher's exact test: P = 0.294; difference = 4%, 95% CI: -16% to 24%) and complications between groups (Fisher's exact test: P = 0.574; difference = 4.5%, 95% CI: -12% to 21%). Both groups gradually lost peri-implant bone in a highly statistically significant way at 2, 8 and 14 months, and at 4, 5 and 10 years. After 10 years, immediately loaded patients lost an average of 1.34 mm and early loaded patients lost 1.42 mm of peri-implant marginal bone. At 10 years, there was a statistically significant recession (P < 0.001) of the vestibular soft tissues from baseline (delivery of the final restorations 8 months after implant placement) at both immediate (0.38 mm) and early (0.25 mm) loaded implants. There were no statistically significant differences in terms of peri-implant bone (difference = 0.08 mm, 95% CI: -0.49 to 0.65; P = 0.49) and soft-tissue level changes (difference = 0.07 mm, 95% CI: -0.48 to 0.62; P = 0.469) between the two groups at 10 years after loading. Conclusions: In well-maintained patients, complications are uncommon and healthy and stable peri-implant tissues can be maintained for 10 years around both immediate and early loaded implants. Conflict-of-interest statement: This trial was independently designed and initiated by the investigators. BIOMET 3i, the manufacturer of the implants used in this investigation, provided partial economic support at a later stage, and finally ZIMMER-BIOMET partially supported the present publication, however data belonged to the authors and by no means did the sponsor interfere with the conduct of the trial or the publication of its results. Purpose: To compare the clinical outcome of single implants placed immediately after tooth extraction with implants placed 6 weeks after tooth extraction (immediate-delayed placement), and with implants placed after 4 months of extraction and socket healing (delayed placement). 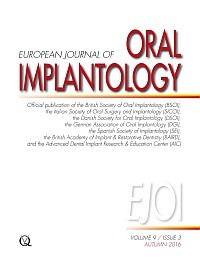 Materials and methods: Two hundred and ten patients requiring a single implant-supported crown to replace a tooth to be extracted were randomised to receive immediate post-extractive implants (70 patients), immediate-delayed implants at 6 weeks (70 patients), and delayed implants after 4 months of healing (70 patients), according to a parallel group design. When needed, patients of the immediate and immediate-delayed group had the socket grafted with a bone substitute and covered with a resorbable membrane at implant placement. Sockets randomised to delayed implants were grafted in the same manner if poorly preserved or in the aesthetic areas (from second upper to second upper premolars). Implants inserted with at least 25 Ncm torque were left to heal unloaded for 4 months, whereas those inserted with less than 25 Ncm were left to heal unloaded for 6 months. Temporary crowns were delivered and were to be replaced by definitive ones after 4 months. Outcome measures were crown and implant failures, complications, peri-implant marginal bone level changes, aesthetics assessed using the pink esthetic score (PES) and patient satisfaction recorded by blinded assessors. Results: Three patients dropped out from the immediate, five from the immediate-delayed and six from the delayed group up to 4-months post-loading. Four implants (6.0%) failed in the immediate, four (6.2%) in the immediate-delayed and one (1.6%) from the delayed group (P (chi-square test) = 0.369). Apart from the crown failures due to implant losses, no other crown had to be remade. Five immediate, six immediate-delayed and three delayed implants were affected by one complication each (P (chi-square test) = 0.601). Mean peri-implant marginal bone loss after 4 months was -0.17 ± 0.11 mm (95% CI: -0.20; -0.15) at immediate, -0.20 ± 0.09 mm (95% CI: -0.23; -0.18) at immediate-delayed, and -0.24 ± 0.12 mm (95% CI: -0.27; -0.21) at delayed placed implants (P (Kruskal Wallis test) = 0.006). At delivery of definitive crowns, 4 months after loading, the mean total aesthetic score was 12.48, 12.38 and 11.71 in the immediate, immediate-delayed and delayed groups, respectively (P (Kruskal Wallis test) < 0.001). All patients were fully satisfied with both function and aesthetics, and would undergo the same procedure again, with four exceptions (one from the immediate, one from the immediate-delayed and two from the delayed group), who were partially satisfied with the aesthetics (P = 0.785). Conclusions: No statistically significant differences for failures, complications and patient satisfaction were observed when placing single implants immediately, 6 weeks or four months after tooth extraction; nevertheless failures and complications were more frequent for immediate and immediate-delayed placed implants. Bone level changes were similar between the different procedures, but the aesthetics showed better results for immediate and immediate-delayed implants. Conflict-of-interest statement: This trial was partially funded by Nobel Biocare Services AG (code: 2010-894), the manufacturer of the implants evaluated in this investigation, however data belonged to the authors and by no means did the manufacturer interfere with the conduct of the trial or the publication of the results. Purpose: To compare the clinical outcome of single, partial and full fixed implant-supported prostheses immediately loaded (within 48 h), early loaded at 6 weeks and conventionally loaded at 3 months (delayed loading). Materials and methods: Eighty-one patients (27 requiring single implants, 27 requiring partial fixed prostheses and 27 requiring total fixed cross-arch prostheses) were randomised in equal numbers in three private practices to immediate loading (27 patients), early loading (27 patients) and conventional loading (27 patients) according to a parallel group design with three arms. To be immediately or early loaded, implants had to be inserted with a torque superior to 40 Ncm. Implants were initially loaded with provisional prostheses and replaced after 4 months by definitive ones. Outcome measures were prosthesis and implant failures and complications. Results: No patient dropped out up to 4-months post-loading. No implant or prosthesis failed or any complications occurred. Conclusions: All loading strategies were highly successful and no differences could be observed for implant survival and complications when loading implants immediately, early or conventionally. Conflict-of-interest statement: This trial was partially funded by MegaGen, the manufacturer of the implants evaluated in this investigation, however data belonged to the authors and by no means did the manufacturer interfere with the conduct of the trial or the publication of its results. Purpose: To test the hypothesis that there is no difference in clinical, radiographic and aesthetic outcomes positioning single post-extractive ultra-wide 7 mm-diameter implants or waiting 4 months to place implant, after molar extraction and the socket preservation procedure. Material and methods: Patients requiring one implant-supported single restoration to replace a failed tooth in the molar region of both maxilla and mandible were selected. Patients were randomised according to a parallel group design into two arms: implant installation in fresh extraction sockets augmented with corticocancellous heterologous bone and porcine derma (group A) or delayed implant installation 4 months after tooth extraction and socket preservation using the same materials (group B). Ultra-wide 7 mm-diameter implants were submerged for 4 months. Outcome measures were implant success and survival; complications; horizontal dimensional changes measured on cone beam computed tomography (CBCT) scans at three levels, localised 1, 2 and 3 mm below the most coronal aspect of the bone crest (level A, B and C); peri-implant marginal bone level changes; implant stability quotient (ISQ); and pink esthetic score (PES). Results: Twelve patients were randomised to group A and 12 to group B. No patients dropped out. No implant failed or complications occurred up to 6-months post-loading. Six months after loading there was more horizontal alveolar bone reduction at immediate post-extractive implants, which was statistically significant. At level A was 1.78 mm ± 1.30 in group A, 0.45 mm ± 0.42 in group B, (difference 1.33 mm ± 1.39; 95% CI: 0.38 to 1.95; P = 0.003); at level B was 0.98 mm ± 1.13 in group A, 0.14 mm ± 0.22 in group B, (difference 0.84 mm ± 1.16; 95% CI: 0.24 to 1.07; P = 0.019); at level C was 0.55 mm ± 0.74 in group A, 0.03 mm ± 0.24 in group B, (difference 0.51 mm ± 0.76, 95% CI: 0.01 to 0.87; P = 0.032). One year after implant placement, mean peri-implant marginal bone loss was 0.43 mm ± 0.37 for group A and 0.10 mm ± 0.10 for group B, showing a statistically significant difference between groups (difference 0.33 mm ± 0.30; 95% CI: 18 to 0.52; P = 0.010). Mean ISQ value was 78.8 ± 2.8 for group A and 79.9 ± 3.6 for group B, showing no statistically significant differences between groups (difference 1.1 ± 2.6; 95% CI: 0.04 to 2.96; P = 0.422). Mean PES was similar in both groups (10.7 ± 1.5 [range: 8 to 13] in group A and 11.7 ± 1.2 [range: 10 to 13] in group B; difference 1.0 ± 2.2; 95% CI: -0.23 to 2.23; P = 0.081). Conclusions: Single post-extractive ultra-wide 7 mm-diameter implants, in combination with socket preservation, might be a possible strategy in the replacement of hopeless molars in both jaws, with high implant and prosthetic survival and success rates, and good aesthetic outcomes. Longer follow-ups are needed to properly evaluate this therapeutic option. Conflict-of-interest statement: Dr Marco Tallarico is Research and Scientific Project Manager of Osstem AIC Italy. However, this study was not supported by any company and all authors declare no conflicts of interest. Purpose: To report the outcome of graftless osteotome sinus floor elevation (OSFE) in order to evaluate whether apical bone gain depends on the initial residual bone height and whether the initial residual bone height has an influence on the amount of marginal bone loss. Furthermore the study aimed to assess if perforations of the Schneiderian membrane or residual bone height are potential predictors of implant survival. Materials and methods: In this retrospective study all patients were included who were treated between 2001 and 2010 and received dental implants in combination with OSFE in a private practice. Patients having 1 to 11 mm of residual bone height were subjected to crestal sinus lift elevation. One hundred and thirteen patients with 233 implants were included in this study. The follow-up period was 5-years post-loading for all patients. The average initial bone level height was 5.9 ± 1.7 mm. No bone graft or substitute material was used. All implants healed transgingivally and were loaded 3 months after insertion. Outcome measures were prosthetic success, implant success, complications, radiographic crestal bone level changes and apical (sinus floor) bone height. Results: Sixty-three patients dropped out during the 5-year post-loading follow-up. Seven implants in 7 patients failed. Implant survival rate 5 years after loading was 93.8% at patient level. Implants succeeded in 92.7% of all cases. In six patients (5.3%), prostheses failed and had to be remade. Minor complications like small ceramic fractures and loosening of prosthetics were observed in seven patients (6.2%). Average marginal bone loss at 5 years of follow-up was 0.5 ± 0.8 mm per patient. No correlation was found between marginal bone loss and initial residual bone height. Average gained bone height was 4.5 ± 1.4 mm after 5 years of loading. We found a significantly negative linear correlation for apical bone gain depending on the baseline bone level (P < 0.001). The apical bone gain was higher in cases with less residual bone. Conclusions: Implants after graftless osteotome sinus floor elevation showed excellent survival and success rates after 5 years of loading. Apical gain of newly formed bone was positively correlated with the initial bone height showing a statistical significance. However, initial residual bone height is also a predictor for implant survival, i.e. survival increases by 1.6 times with every additional millimetre of initial residual bone height. Conflict-of-interest statement: All authors declare that they have neither financial nor non-financial competing interests. Purpose: The present prospective pilot study aimed to evaluate the feasibility of Onplants (Onplant Orthodontic System) off label use in the highly atrophic edentulous maxillae of adult patients to avoid bone grafting and conventional dental or zygomatic implants. Material and methods: Two Onplants were placed subperiosteally in the anterior part of the hard palate in five adult patients presenting a highly atrophic edentulous maxilla, class V or VI, according to Cawood and Howell. After a healing period of 4 months the prosthetic procedures were started. Outcome measures were the survival rate of the Onplant system, complication rate and OHRQoL using a OHIP-G questionnaire at three different stages: before and after the Onplant placement and at the end of treatment. Results: Unexpectedly, the present study had to be discontinued due to the early loss of all 10 Onplants at the time of prosthetic loading. In total, 16 patients were meant to participate, but the study was stopped after complete failures of the first five patients. While all inserted Onplants became unstable, no other complications like penetration of the nasal cavity, infections or fractures of the abutment screw were observed. The patient satisfaction and the oral health-related quality of life declined with the number of surgical interventions and finally with the Onplant failure. Conclusions: The anterior part of the adult hard palate apparently did not present adequate bone regenerative capacity to support Onplant-prosthetic rehabilitation. Off-label Onplant-supported prostheses are contraindicated for permanent maxillary rehabilitation in edentulous adult patients. Conflict-of-interest statement: The original manufacturer provided the materials free of charge in this investigator-sponsored research (code: 2011-1027). The authors declare no conflicts of interest in relation to this study. Purpose: MRI allows radiation-free imaging of the head and neck area. However, implant-supported prostheses may severely impair image quality due to artefacts. Therefore, identification of preferable material compositions for implants and supported prostheses with little impact on MR image quality is mandatory. Materials and methods: Overall, one zirconia and four titanium dental implants were provided with different single crown materials: porcelain-fused-to-metal precious alloy (GP-T), porcelain-fused-to-metal non-precious alloy (CCT-T), porcelain-fused-to-zirconia (ZC-T) and monolithic zirconia (Z-T, Z-Z). Three-dimensional artefact volume was determined on a 3 Tesla MRI, applying two standard sequence types (SPACE and TSE). Two-way ANOVA and pair-wise post-hoc Turkey test were performed for comparison of artefact size. Results: Fewest MR artefacts were observed with zirconia implant combined with monolithic zirconia crown. A titanium implant combined with a single crown framework out of the non-precious alloys was unfavourable in terms of artefact volume. Smaller and comparable artefact volumes were noted for titanium implants with the remaining three crown materials (GP-T, ZC-T and Z-T). Conclusions: Material composition of dental implants provided with single crowns has a profound impact on artefact volume. In comparison with crowns containing cobalt, chromium and tungsten, the MRI artefacts are reduced in precious alloy- and zirconia-based crowns. Further studies are needed to assess whether residual artefacts allow sufficient diagnostic imaging with these crowns. Conflict-of-interest statement: The authors have nothing to disclose. This section presents a brief review of articles on dental implants considered of special interest for the reader, in order to encourage the development of research, an interest for data analysis and attention for scientific publications. Your comments are welcome. Please contact Dr Michele Nieri at: michelenieri@gmail.com.